In the late Eighties and early Nineties I was a regular viewer of MTV, back when they were still broadcasting music videos. I was not the only one: I had a fellow student and friend who was just as addicted to the channel as I was. We both loved Rebecca de Ruvo, and hated Simone Angel (We had so much in common). The difference between the two became more obvious when they recorded music. Rebecca released 'I caught you out' in 1994, Simone released 'When love rules the world' in 1991. While the former is an interesting funky dance track, the latter is just a throwaway house clone with bad vocals. It's these vocals my friend and me had loads of fun with. Whenever I grunted 'When love rules the world' he would reply with a falsetto 'When love rules the world!' and vice versa. This single is a souvenir of those times. It's actually one of few songs in my singles collection that I don't like. 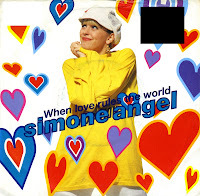 What happened to Simone Angel? She moved to the other side of the world - thankfully - and is - unfortunately - still presenting a radio show there. She has a blog which you can read here.